The Killen-Walsh Manufacturing Company made farm tractors. 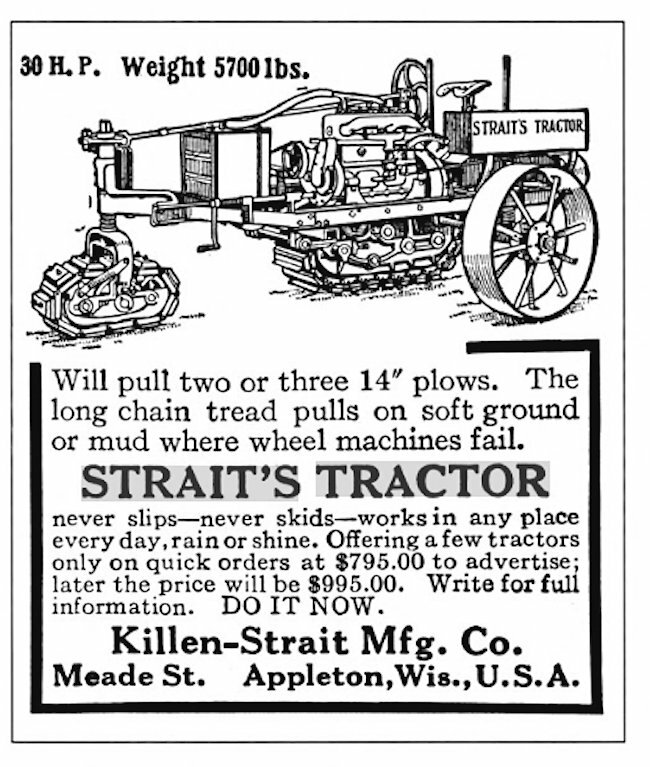 It changed its name to Killen-Strait in 1914, to build the agricultural tricycle Strait’s Tractor, designed by William Strait. Their factory was in Meade Street, Appleton, Wisconsin in the USA. The first version was powered by a four-cylinder Doman engine with a 6x 7-inch bore and stroke engine that produced 40hp. It was known as the 30-50 model. The later version was called the model 3 15-30 tractor but had a less powerful engine. It was powered by a four-cylinder 4 1/2 inch x 5 3/4 inch bore and stroke Waukesha engine that produced 30hp. It was advertised as being able to pull two or three 14 inch ploughs. 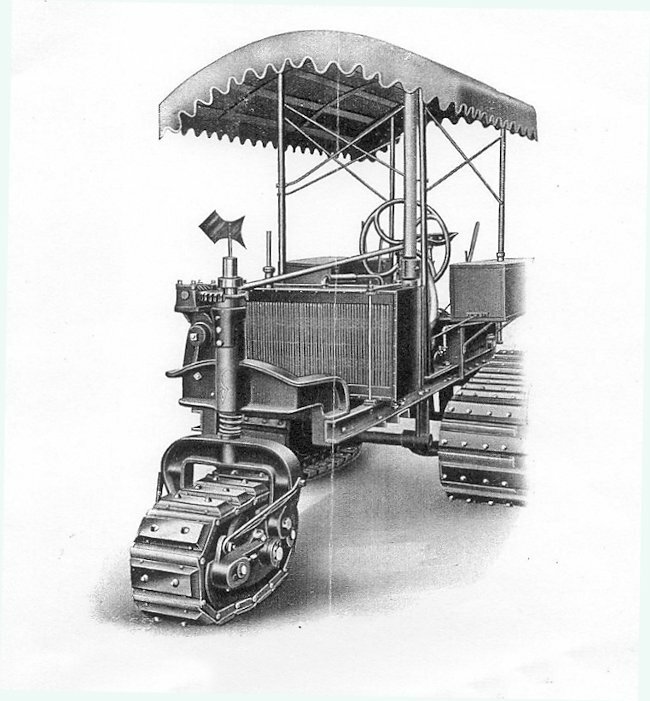 It had one caterpillar track at the front and two at the back. The front track was used to steer the vehicle. The two at the rear provided the propulsion. A small directional metal vein was fitted above it, which showed the driver which way the front track was pointing as visibility from the driver’s seat was poor. The tracks were held together with chains and they were made of hardwood. The working surfaces were faced in steel sheets. The links were joined together with case hardened steel pins 1 inch in diameter and 13 inches long. These pins had a bearing surface over their entire length. The wheels served to keep the track in line, but were not used to transmit any power. The power is positively applied to the track by driving sprockets with detachable case hardened rims. 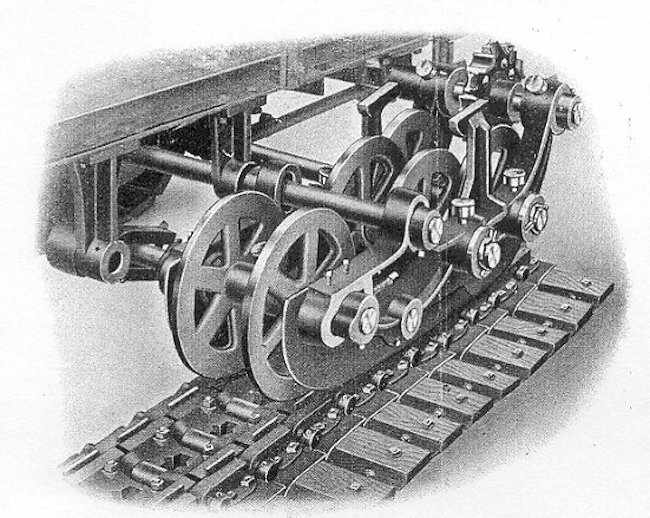 Three links of the chain engage the sprocket at one time, thus minimizing the wear. 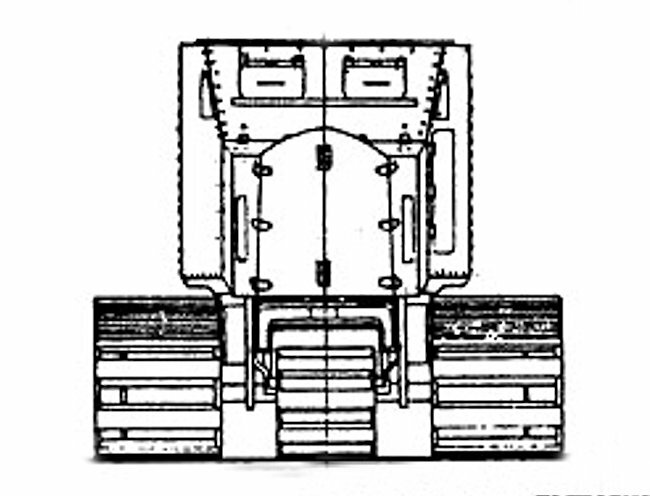 The chain could be tightened when necessary by moving the front set of idler wheels forward. The links had depressions in them to engage with the drive sprocket teeth. The steep angle of the tracks at the rear allowed it to reverse over difficult obstacles that were impassable for other tracked tractors. 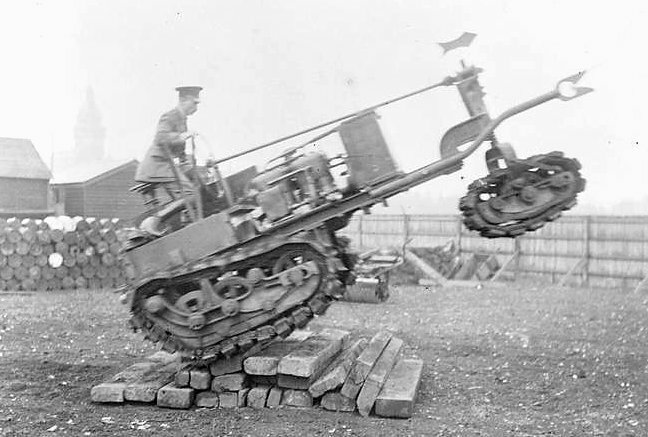 It has been argued that these upward tilting tracks on the Killen-Strait tractor inspired the rhomboid shape tracks on the front of the future British Mark I tank, but others disagree. 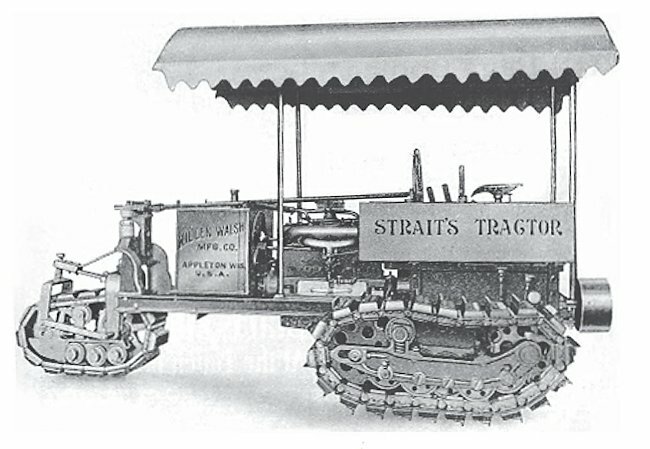 The Strait’s Tractor used a 1914 car type transmission gear box with cut steel, case hardened gears running in a bath of oil. 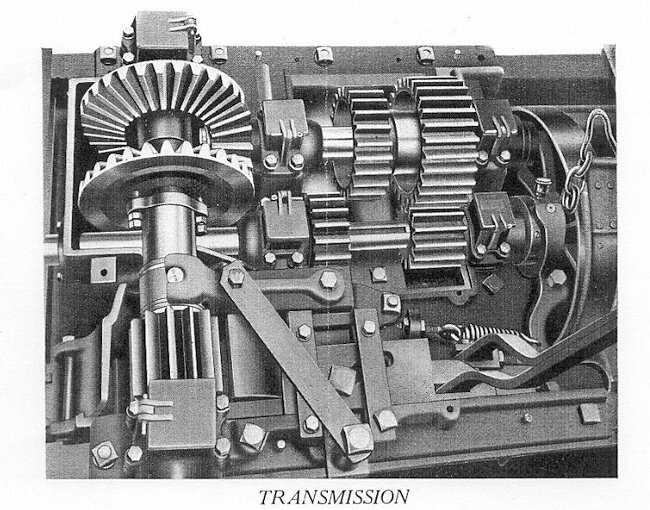 The connection to the engine was via a sliding cone clutch faced with Raybestos. The spur gears had four inch faces and a heavy pitch. They had ample strength to take the strain put on them. There were two speeds forward and one reverse gear. 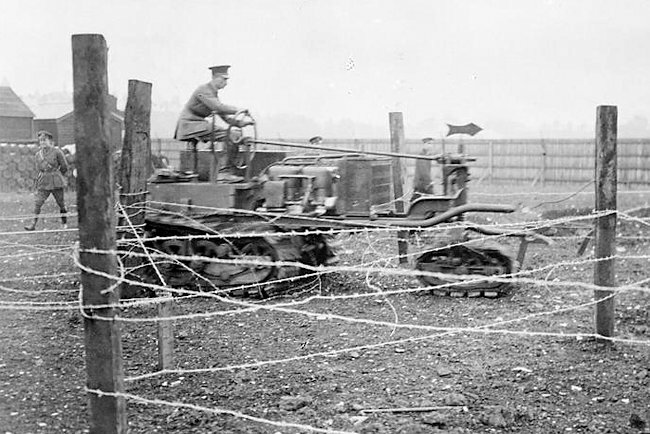 On 30 June 1915, Killen-Strait shipped one of their tractors over to London so they could demonstrate its cross country qualities to members of the British Government and Army high command. Winston Churchill, the 1st Lord of the Admiralty and Minster of Munitions, and the future WW1 Prime Minister David Lloyd George were in attendance. Other observers were the Duke of Westminster, Sir Frederick Black (Director of Munitions Supply), Major General Sir Ivor Phillipps, Major General Scott-Moncrieff, Col Holden, Brigadier General Louis Jackson (Head of Trench Warfare at MoM). 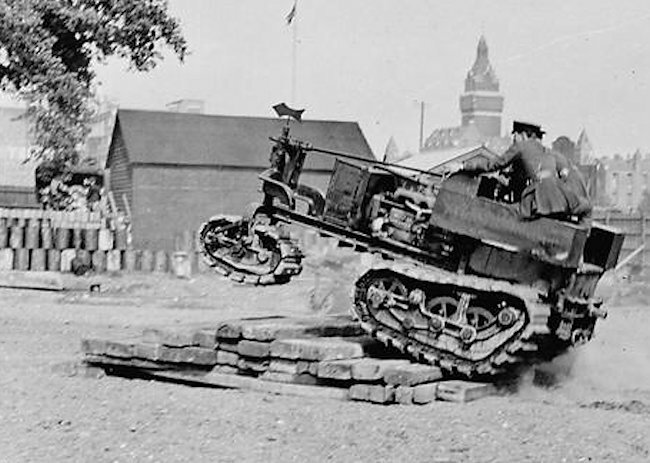 Jackson later went on to support Swinton and Tulloch demonstrate the American Holt tractor that was used on the Little Willie tank prototype. The demonstration happened at the Talbot Recreation Ground adjoining to the Royal Naval Air Service (R.N.A.S.) 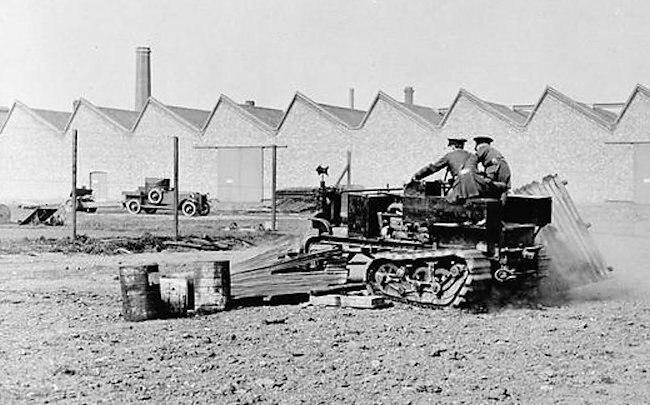 Armoured Car Division H. Q., Clement Talbot Works, Barlby Road, Wormwood Scrubbs, London. Churchill was on the lookout for a caterpillar track fitted vehicle that could cross enemy trenches and destroy all wire entanglements. 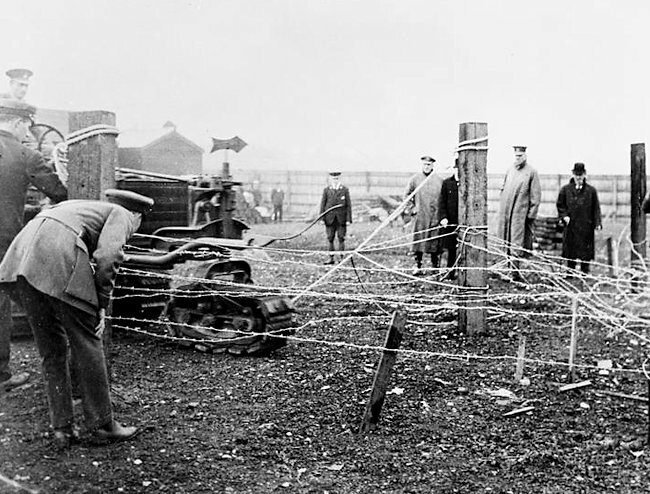 The Ministry of Munitions were looking for a vehicle that could cut the ‘no-mans land’ battlefield barbed wire. On the same day, the British War Office issued its specification for a ‘machine gun destroyer’ to the Admiralty’s Landships Committee, based at 83 Pall Mall and chaired by Churchill. It is interesting to note that Navy terms were used during the development of the first tanks, not the Army ones. The phrase ‘machine gun destroyer’ can be interpreted in two ways. One is that it is a vehicle that kills machine gun nests and the other is it is a vehicle like a fast agile navy destroyer class ship armed with machine guns. 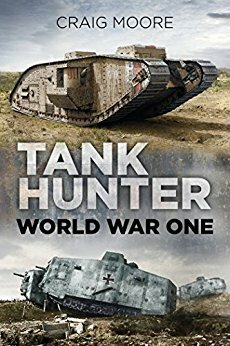 Early tanks were known as Landships. Lt. Oliver Thorneycroft fitted two scissor-like Royal Navy torpedo net cutters at the end of two protruding shaped metal poles, to the front of the Killen-Strait tractor. The machine was driven into a cat’s cradle of tensioned barbed wire that for demonstration purposes had been prudently strung up at precisely the cutters height. It did not work so well on randomly spaced barbed wire at different heights. The trials were not successful for the Killen-Strait Manufacturing Company. Although it had good mobility and could negotiate many obstacles put in its way, it was not powerful enough to rip through barbed wire and drag it out of the way to create a path for infantry. When the wire cutter was fitted to the front of the vehicle it took too long to cut the wire and sometimes it failed to cut the barbed wire. 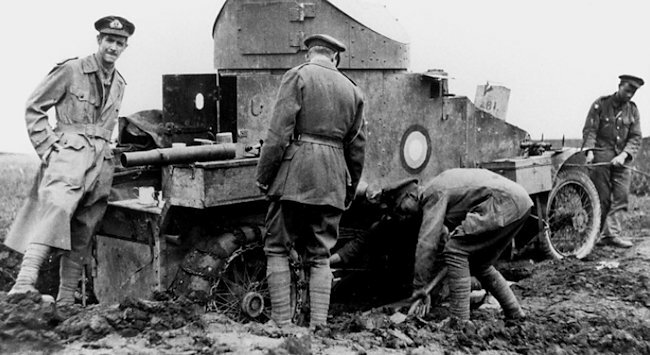 Lt. Symes fitted a turretless Delano-Belleville armored car hull onto the tractor chassis. 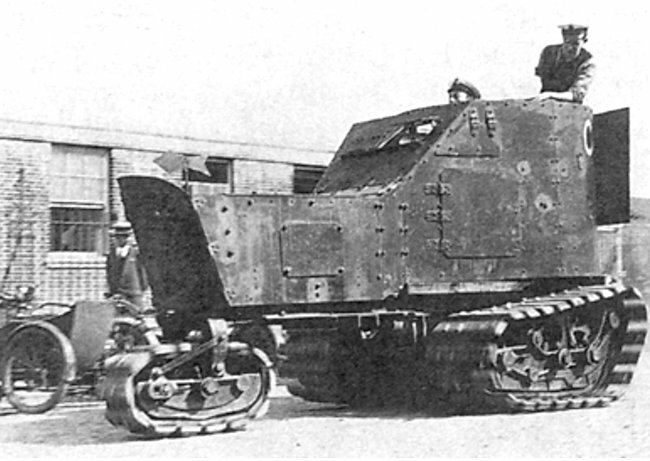 A standard armored car turret could have been fitted at a later date. It was envisioned that this new vehicle would join the ranks of the RNAS Armoured Cars. It made the vehicle very top heavy and gave it a very high profile. This would have made it an easy target for German gunners to see. 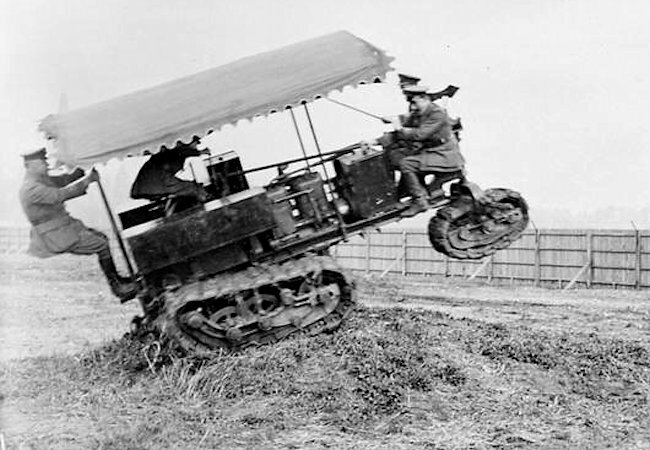 The main reason the Killen-Strait Tractor did not enter production as a Landship tank was that it could not cross wide trenches. 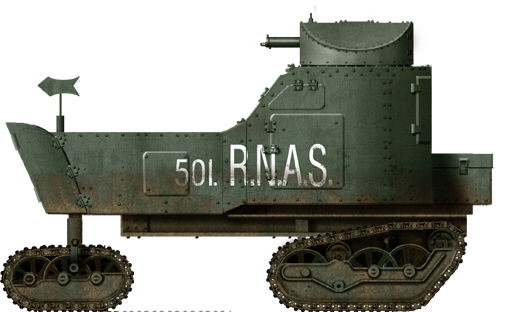 The Royal Naval Air Service (RNAS) Armoured Car Section was formed for fleet reconnaissance, patrolling coasts for enemy ships and submarines, and attacking enemy coastal territory. To cover the great distances along the cost they used armored cars but they found the poor conditions of French and Belgium roads limited their activities. They saw in the Killen-Straits armored tracked tractor a vehicle they could use to get to locations where there were no roads or the roads were in very bad conditions. As the unit grew it was renamed the Royal Naval Air Service Armoured Car Division (RNACD) and spilled into 20 squadrons. In the summer of 1915, the RNACD was disbanded as trench warfare developed. 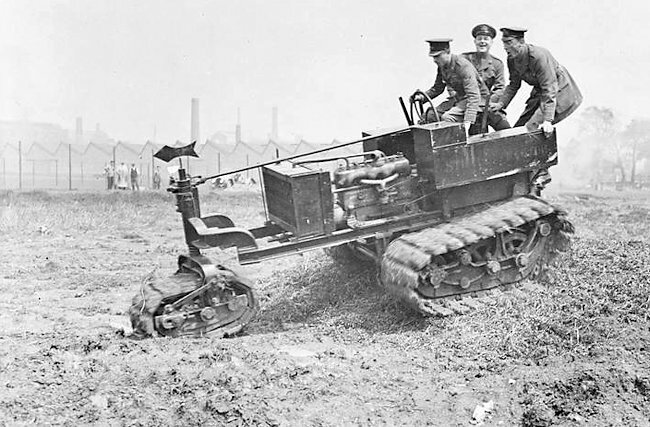 The armored Killen-Strait Tractor ended its days as a tow tractor at the RNAS Barrow Airship Station. It arrived there in September 1915. 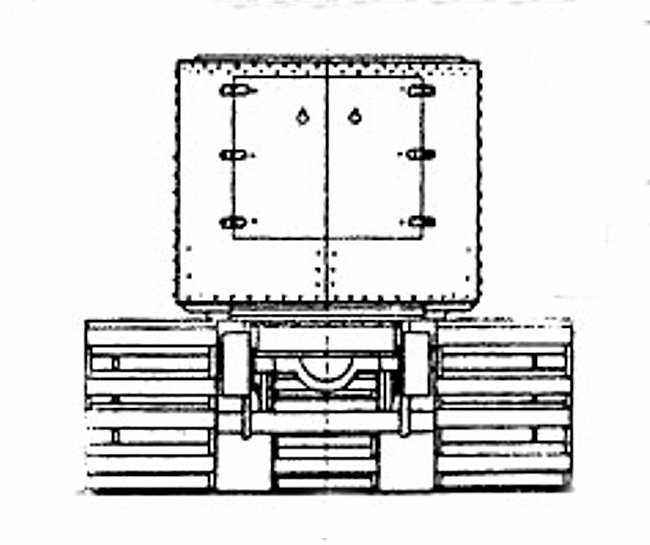 Delano-Belleville armored car hull fitted onto the Strait’s tractor chassis. You can see it was open topped. 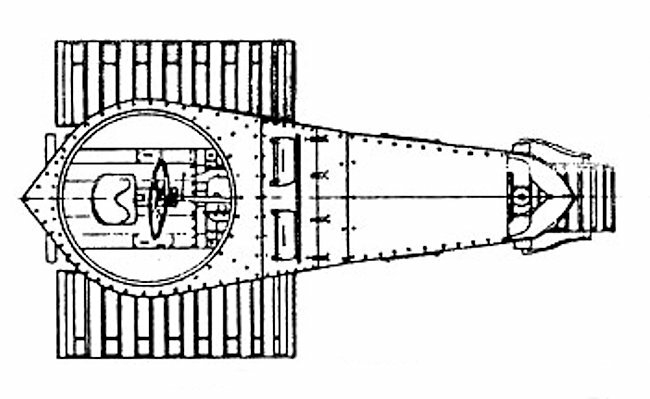 A turret could be fitted later if required. 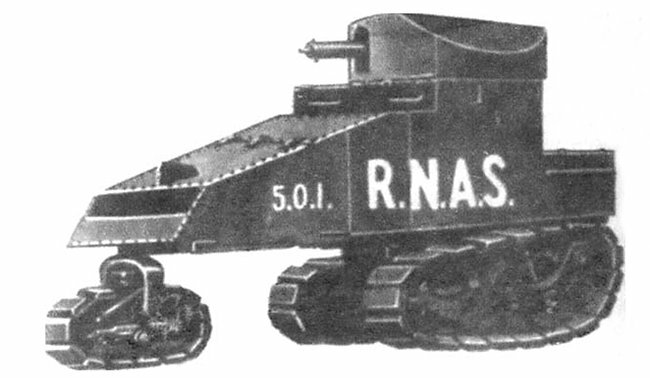 Artists impression of the fully tracked Killen-Strait armored tracked vehicle with turret for use in the R.N.A.S. 501 Armoured Car Squadron.